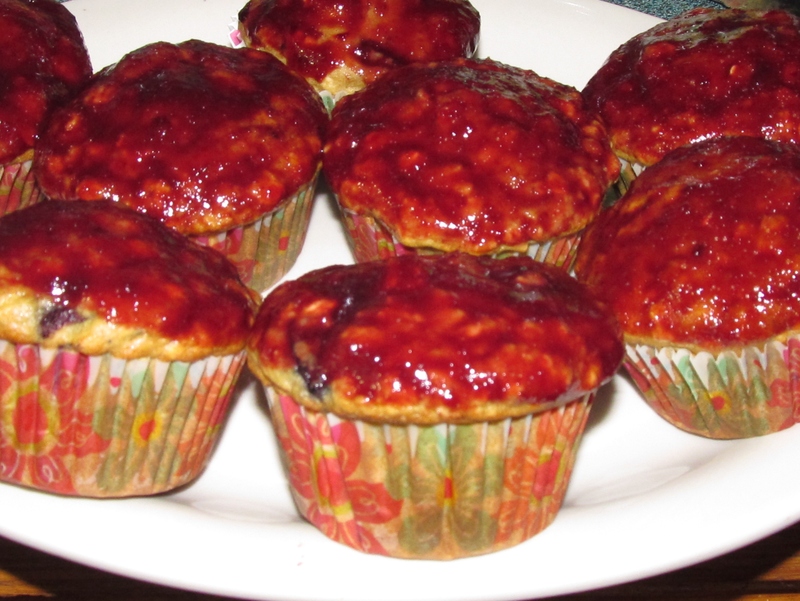 Besides being Gluten Free, these Muffins are low in sugar, fat, and dairy free! In large mixing bowl whisk together, flour, oats, sugar, baking powder, and baking soda. Add oil, water, applesauce, and eggs. Mix just until all dry ingredients are incorporated. Add fruit by folding into batter. Preheat oven to 325*F. Using a triggered ice cream scoop to fill paper cupcake holders with one scoop of batter (about ¼ cup each) . Or if you bake in a larger muffin pan use 2 scoops each. Bake for 25- 30 minutes or until wooden toothpick inserted into center muffin, comes back clean. In small sauce pan, heat ( on medium high heat) all ingredients, until mixture starts to boil. Turn heat to medium, stirring continually and cook for 2 minutes. Let cool slightly and dip each muffin into glaze, coating the entire muffin. Server for breakfast or snack.